BEST-MK 2338 is a one-component, solvent-free, high strength, and high viscous anaerobically curing adhesive based on di-methacrylate-ester. BEST-MK 2338 is specially designed for fastening of coaxial adherends, e.g. bearings, bushings and shaft-/hub connections. Another field of application is the securing and sealing of pipe- and thread connections and the sealing of surfaces, especially in the field of hydraulics. As a sealing for metal thread connections BEST-MK 2338 withstands pressure up to 65 bar (see test report DVGW AZ: 04/327/5146/1). 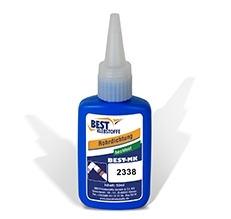 BEST-MK 2338 automatically spreads in the thread without leaking from the thread. Disassembly is not feasible without the possibility of damaging screw or thread.